To support me please visit Click-A-Snap and view my portfolio, every click helps. I got some great news, I have been shortlisted (twice !) for the Event Photographer Of The Year Awards. 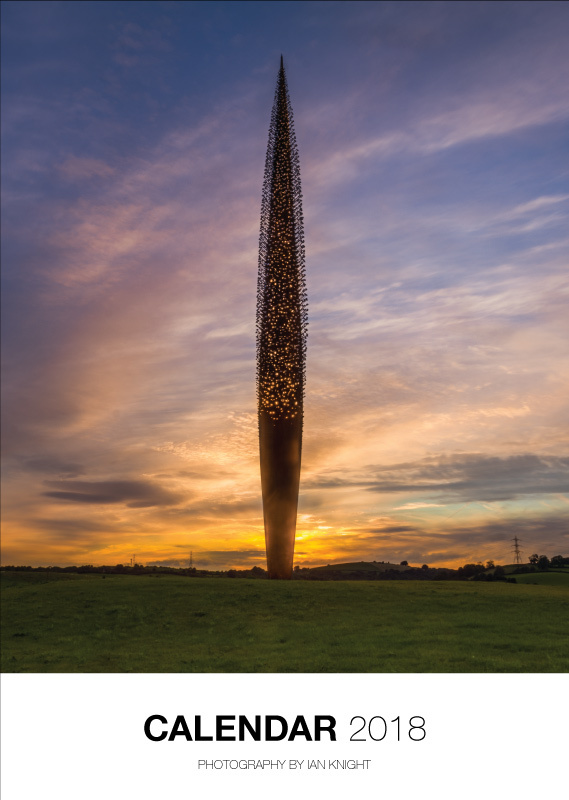 Two of my images in the Cultural section were chosen and I am so pleased they are both images taken locally in Stoke On Trent. 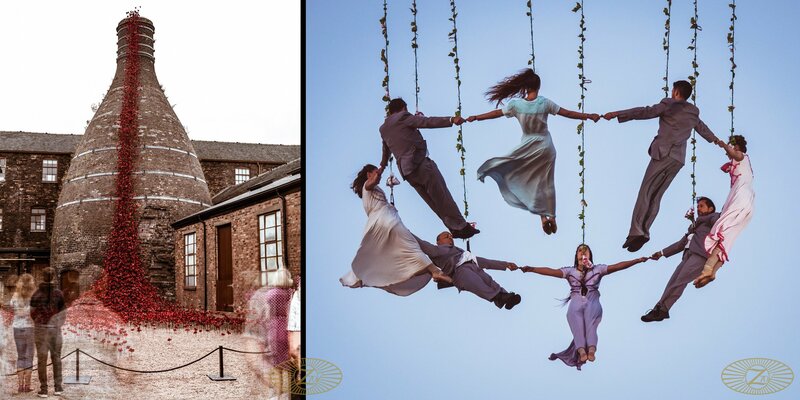 If you have a spare moment then all the photographs are eligible for a peoples choice award, so head over to the shortlist page, find the two images below and click like, I would be very grateful for any votes and help in sharing the information. 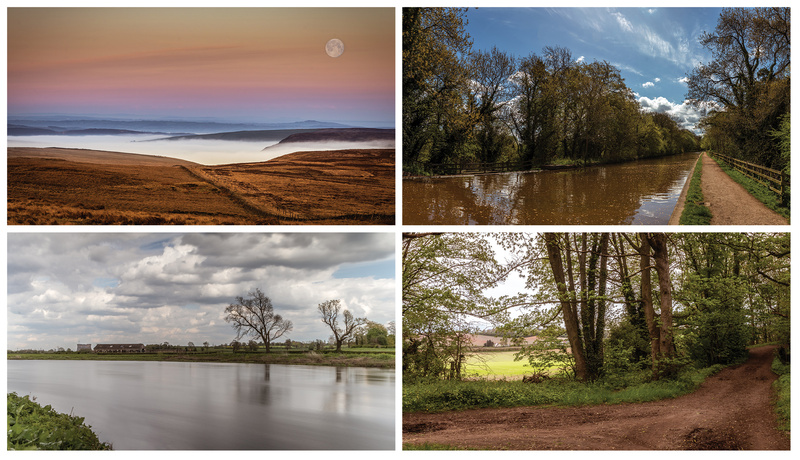 Featuring photographs from the last 12 months, printed on UK A3 sized pages. This year (2018) I have had the good fortune to be able to use Olympus cameras in all sorts of ways and attend some great free! events. 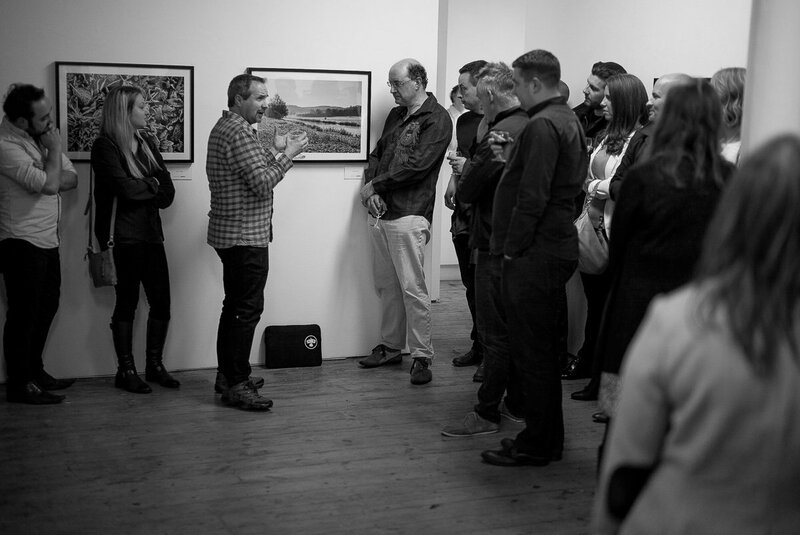 The first event was the Olympus lighting workshop in London at the Park Cameras store. 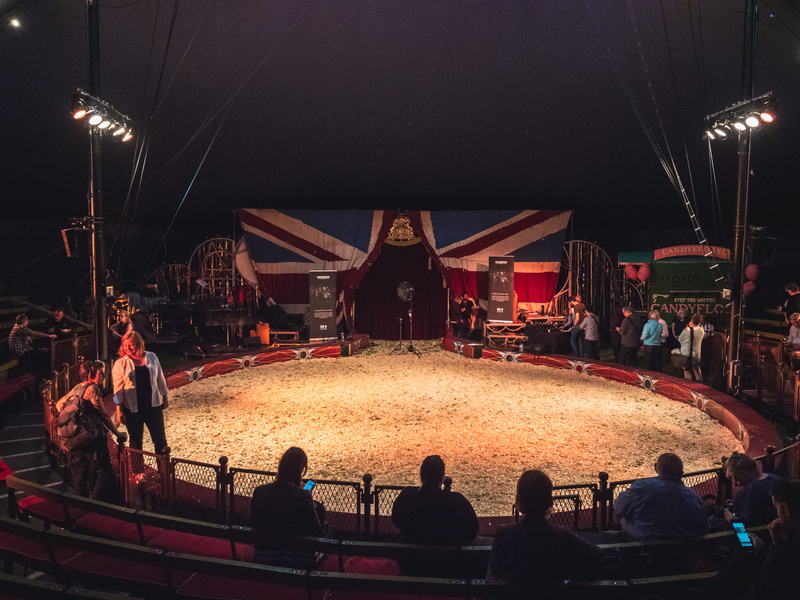 The second was the almost legendary Giffords Circus workshop which was in the grounds of Blenheim palace, if you ever see this advertised put your name down immediately ! Both of those events are covered in much more detail in articles previously published on this site. While attending these events I got to learn about a special service that Olympus UK run that allows people to take a camera and different lenses for a test drive for a few weeks in the comfort of their own home. If you know the Olympus lineup you might think that there is a bit of a gap in that lineup, the Mzuiko 12-40 f2.8 is the usual general purpose lens, but as I already have am EM5 MKII with that lens it is compatible with both cameras so I could just use my existing lens. I am no camera reviewer and I am not going to try and become one overnight, but my initial thoughts on the camera are that is a well rounded and balanced piece of equipment that I would be more than happy to own and use on a daily basis. The menu system is easy to use once you learn the basics, and there are a lot of configuration options to suit the style of most users. Where the Olympus system really does shine though is with the lenses, the ones I was using were some of the best, sharpest, and most versitile lenses I have ever known. The other thing that needs saying is that because of the Micro Four Thirds system the cameras use the lenses are riddiculously light and compact compared to their full frame counterparts. It actually makes travelling with the camera a lot easier if space and weight are a factor. 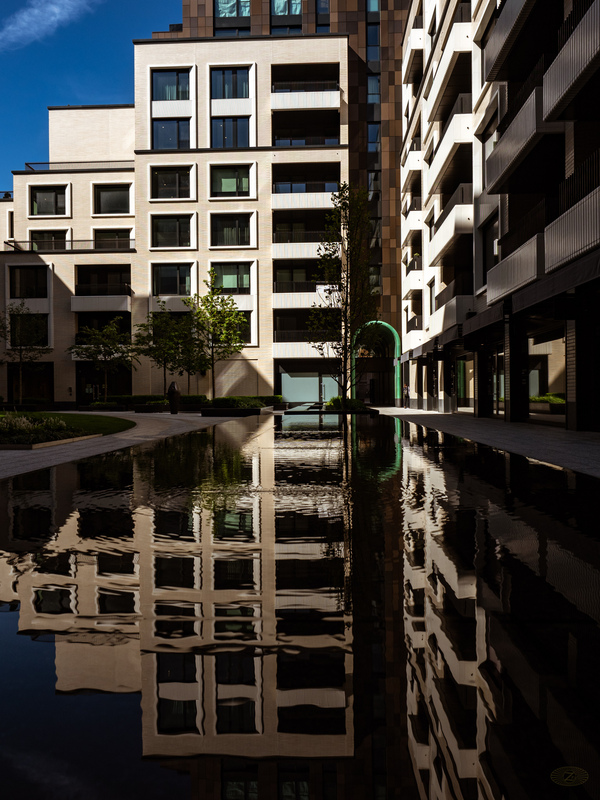 Earlier this year I took my EM-5 on a trip to Poland where I had barely enough luggage space for a couple of changes of clothes, so travelling light was the only option and I was delighted with the resulting images. 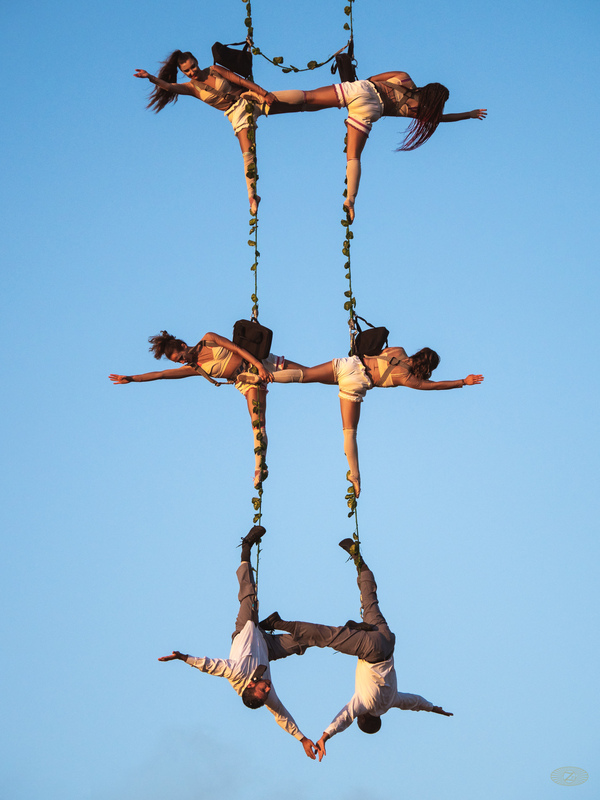 The 300mm prime lens, which is around a 600mm full frame equivalent focal length, was so easy to cary and use, I even found the perfect event to use it at, a local arts festival performance where the performers were dancing in the air attached to wires dangling from a large crane. Yes it sounds mad but it was an excellent and well attended event. Lots of pictures from that using the EM-1, the 300mm lens and the 12-40 for a wider angle can be found here along with many other images from that camera. The next thing I have to sing the praises of, is the in body image stabilisation, simply wonderful, uncomplicated to use and adds several extra stops of use to my usually shaky hands. I was taking images with the 300mm lens at shutter speeds far slower than I could have without the image stabiliser and they were pin sharp. Now for the inevitable part of any camera write up, I have to talk about the ISO performance. Happily I can say that if you expose your images correctly and don't have to do much post work to raise shadows etc then high ISO shouldn't be much of a problem. The downside is that this is a Micro Four Thirds system and there is no getting away from the fact that it is a small sensor, compared to a 35mm full frame equivalent, which means to get the right exposure the ISO quite often has to be higher. The higher ISO noise is not too distracting or ugly, it is just there if you pixel peep. At the time of the loan my main camera was a Canon 80D and I much prefer the noise from the Olympus to that of the Canon. After singing the cameras praises you might think I rushed out and bought one immediately, and if money was not an issue I probably would have already bought an EM-1 to compliment my EM-5. However in my case I do a lot of indoor event and concert work, so my decision was ultimately to not go with Olympus for that work, but to go Full Frame. It was actually a difficult decision as there are features on the Olympus that I won't get elsewhere and the image stabiliser on its own was almost the biggest sell for me. I am very grateful to Olympus for the loan, and the events and workshops they arrange throughout the year, I might even see you on one of those soon as they are always a lot of fun and very informative. 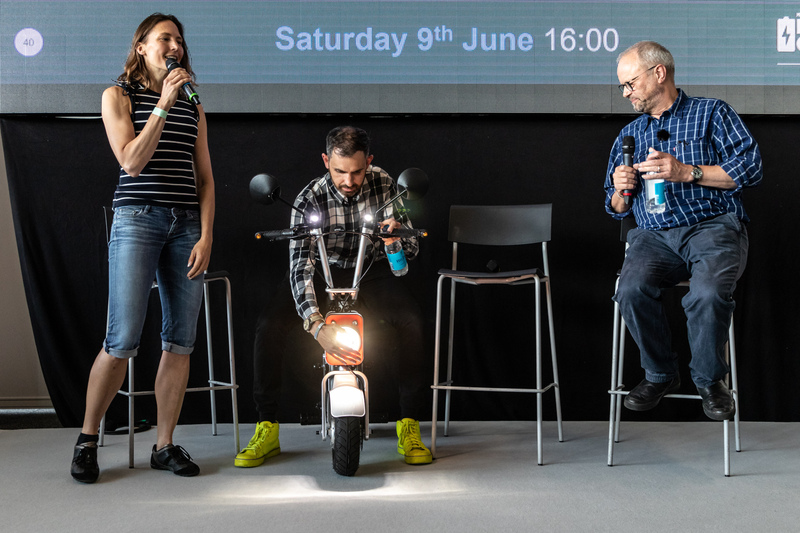 The second part of my photography weekend after the Circus trip was to be an event photographer for the Fully Charged Show Live event at Silverstone. 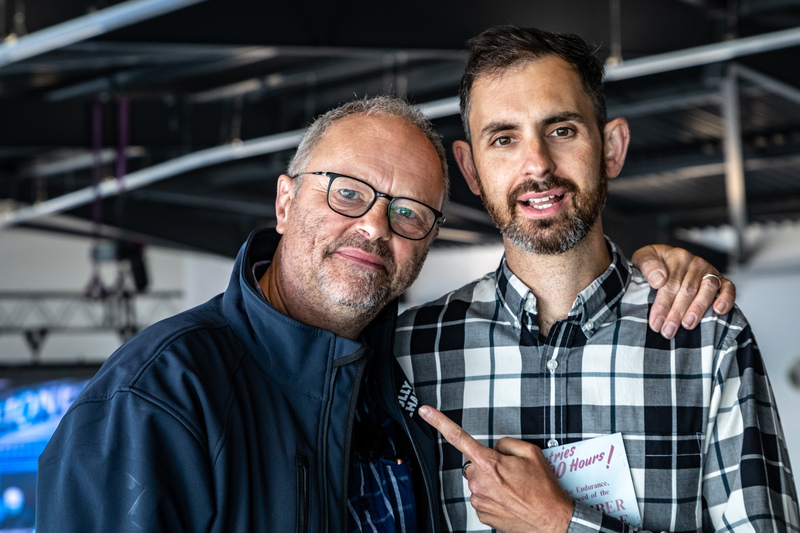 If you don't already know about Fully charged Show, it is a YouTube channel started and hosted by the actor Robert Llewellyn (pictured with co-host Jonny Smith). It is all about renewable energy with a focus on electric cars and related technologies. Since the YouTube channel was doing so well the team behind it all decided to try and organise an alternative motor show, that alternative being an all electric and renewable energy show. Since I have been watching the show from a very early stage and have been enjoying all the free content put up there I sent a speculative email to the organisers to volunteer my photography services for the day. As you can probably guess from all the photographs I got a positive response and managed to arrange it so I could travel from the Oxfordshire Circus workshop to Silverstone. I spent the day wandering the floor of the show, inside and out and taking pictures of the panels. It was actually quite hard to see all of the panels as they proved very popular, there were two panel areas, one with the panel and one with a video screen showing the main stage and both areas were packed out most of the time with people also standing and watching from the sides. 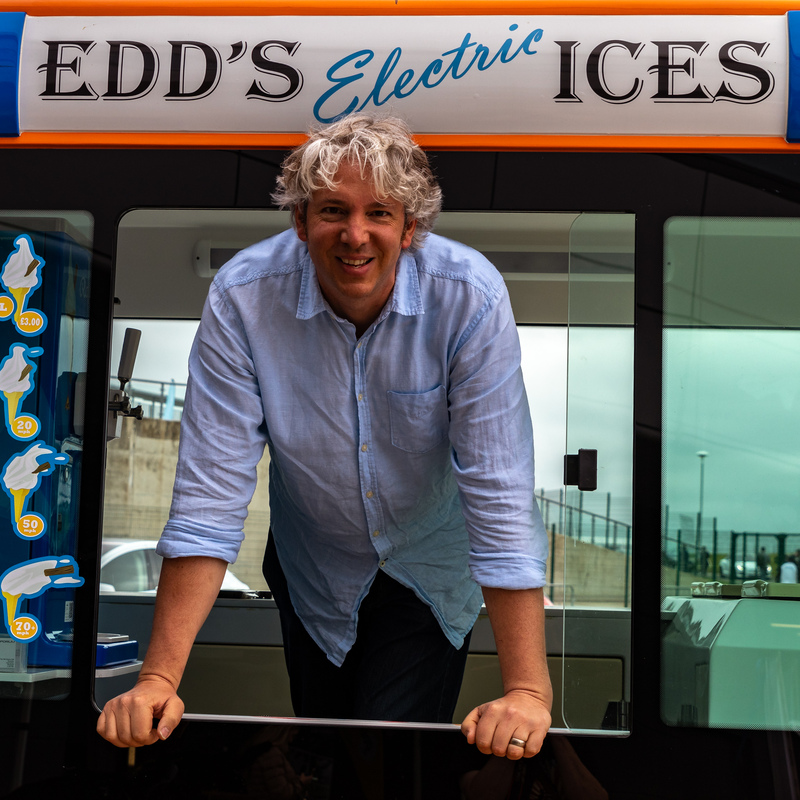 If anyone is familiar with the pioneers of the electric car world and the charging infrastructure being developed independently around the country, they were all present at the show and many many more people who are making names for themselves in the brave new post fossil fuel age. The organisers have said that the show will return next year bigger and better, and even if I am not asked back to do any photography I would go to the show anyway just to see all the exciting new developments in this area. Who knows I might even be taking my own electric car next time. Following on from the Lighting workshop in London a few weeks ago I also applied for a place on the @OlympusUK (twitter) Circus workshop. This time I got a place almost straight away and actually coincided with the most photography filled long weekend I have ever experienced ! 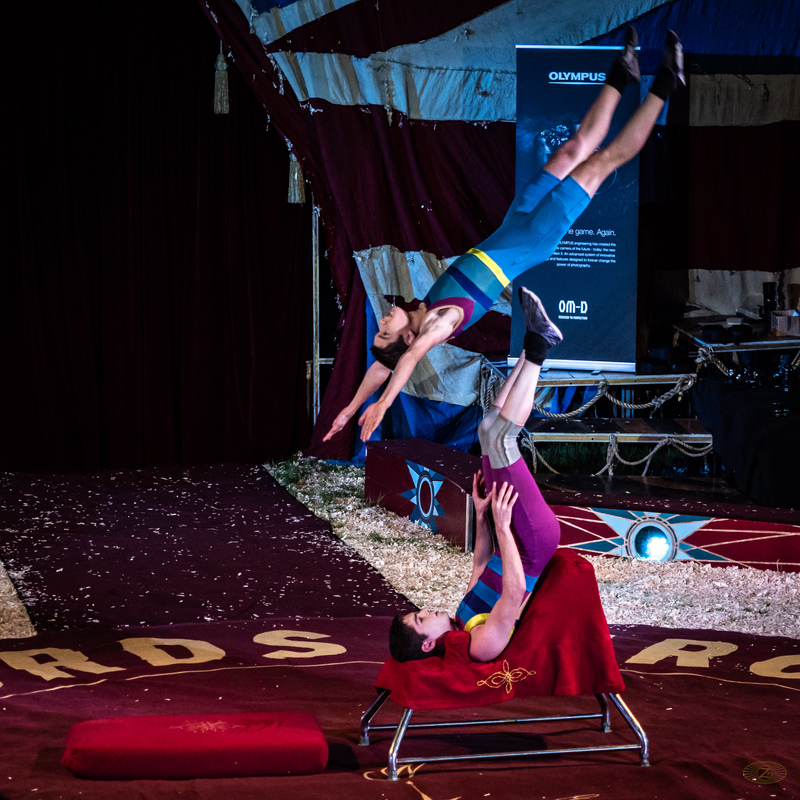 The workshop took place in an actual circus, Giffords Circus to be exact, a small independent and seasonal circus, running from May to September each year. If that wasn't glamourous enough a location, the circus tent was pitched at the magnificent Blenheim Palace which is quite an impressive location, see the photograph below that I took after the workshop. The day was split into four sections, for the first three we were split into three groups and had a small amount of time in three different scenarios. 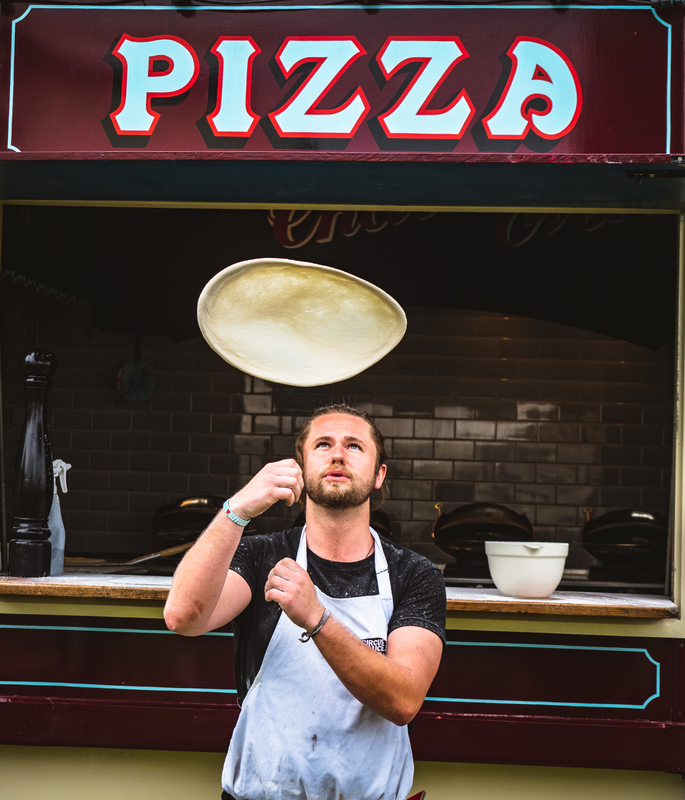 One of which was a pizza throwing demonstration as you can see in this photograph. Lots of fun watching the pizza and lots of flour throwing for action shots. The second was in the café tent with lots of small objects and food to try out our macro and general photography skills. There was so much to see in the tent it was hard to know what to concentrate on first. 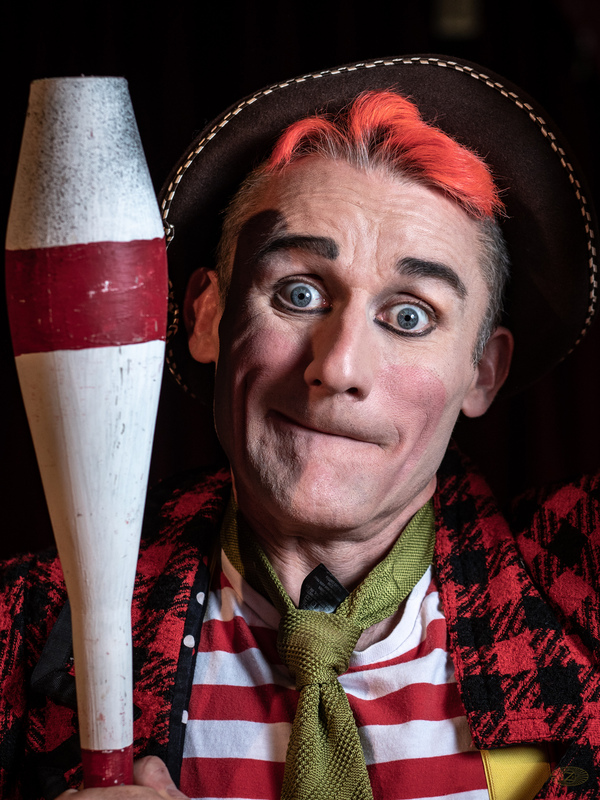 The third section was a portrait session run by Gavin Hoey where we had a very brief few seconds each to photography Tweedy the clown. That didn't stop us all trying to take pictures of Tweedy when it wasn't our official turn and I got a couple of excellent pictures without using the "proper" lighting setup. Finally we all gathered back in the tent where a small selection of circus performers came out and gave us a mini show. The great thing was that as it was not a public performance we could get up and move around to try and get some great shots as they performed. 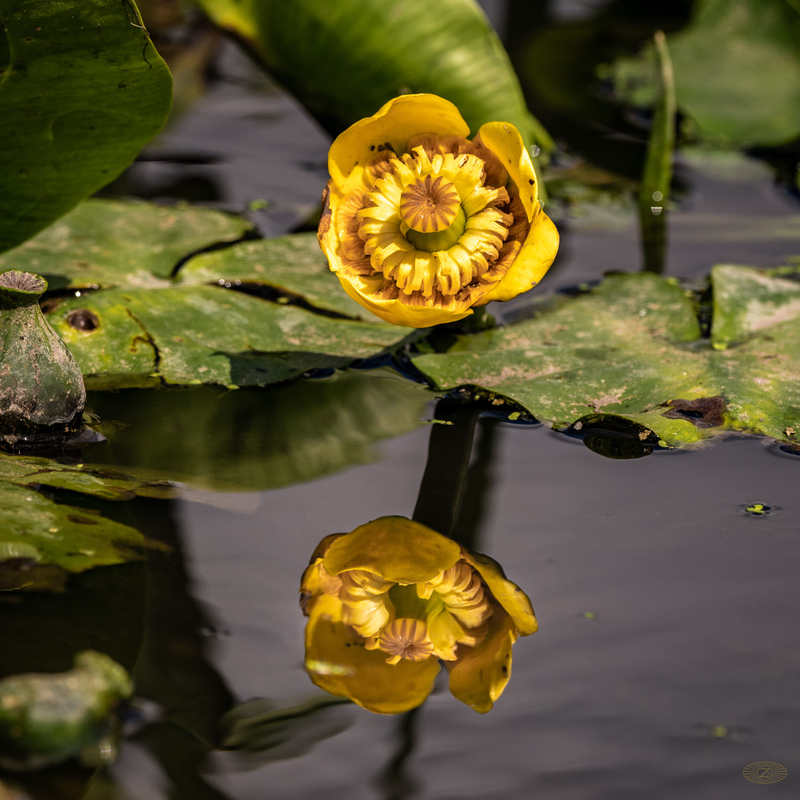 I think I got some excellent images on the day, no doubt a lot of that is down to the Olympus OMD EM1 MKII that I borrowed during for the workshop and the excellent selection of lenses we had to try. I wish I could have stayed for the full circus performance that evening but as you will see with my next post here I had another engagement. 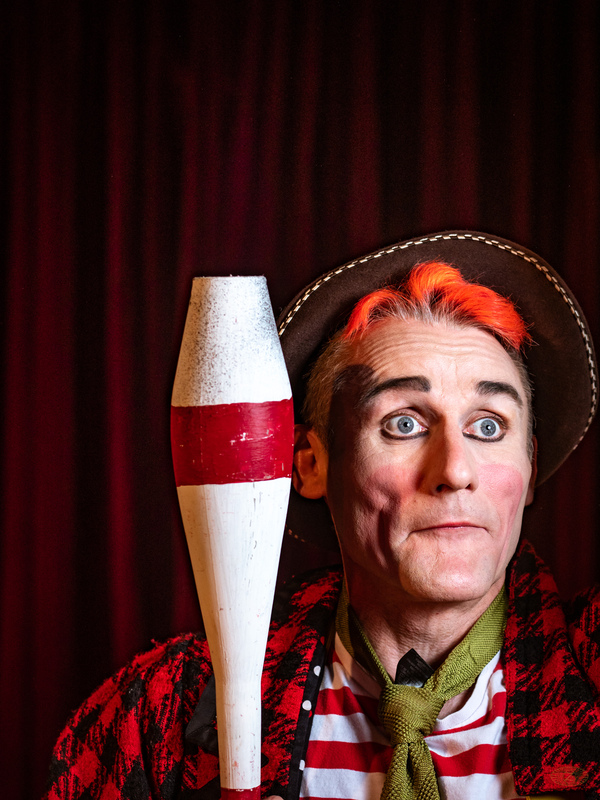 Big thanks to Olympus and Giffords circus for an excellent afternoon of advice, performance and photography. 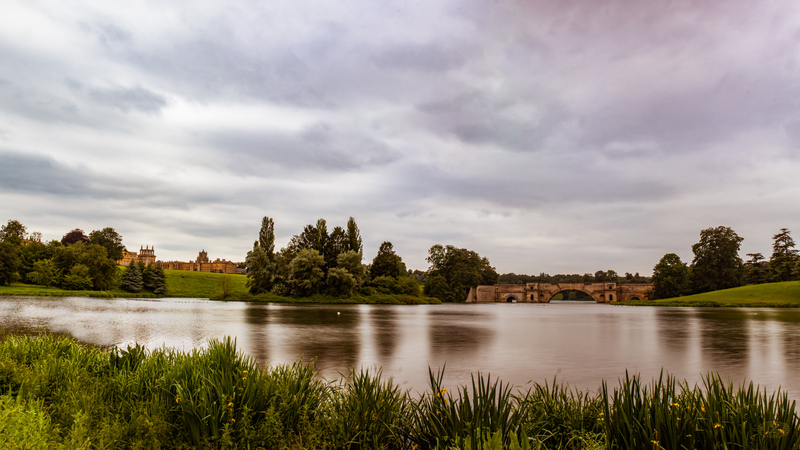 As I mentioned above after we finished I went down to the lake in front of Blenheim and took a stitched panorama shot of the scene as it was so beautiful. Responding to a tweet from @OlympusUK led me to apply for a free lighting workshop at the Park Cameras central London store. Initially I didn't hear anything, but then a few days before the event I got an email to say that someone else couldn't go so I had been given their place. I quickly booked on a train and planned my trip to London. It turned out to be such a beautiful sunny day it was almost a shame to spend it in the basement of the Park store, but it was definitely worth missing out on a few hours of daylight. 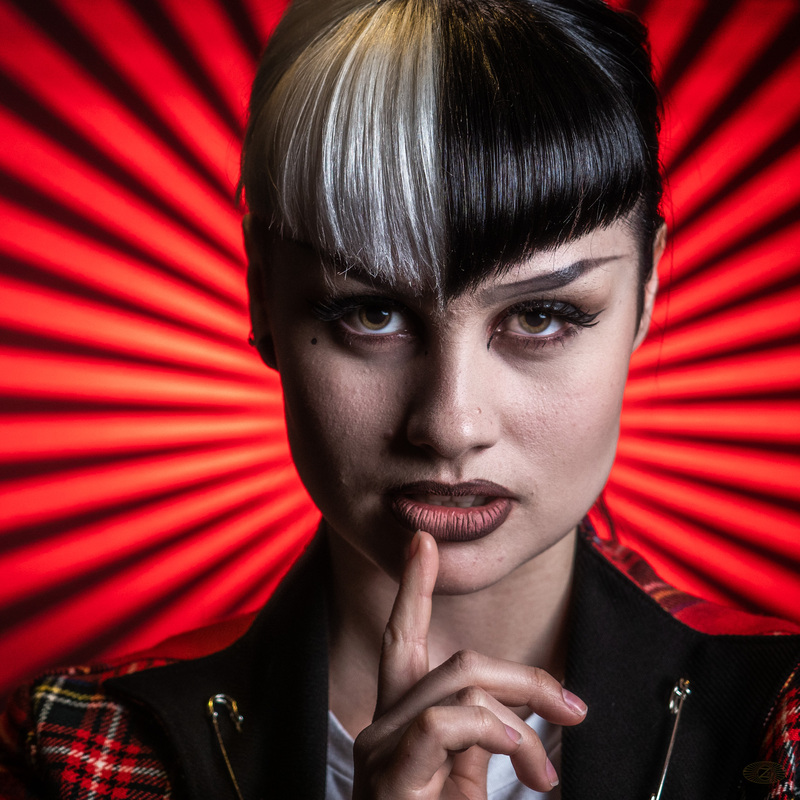 Gavin talked us through the basic principles of studio lighting and how to se them up. At each example we got to try it for ourselves with cameras loaned by Olympus, I was using the OMD EM1 Mark 2 which is really well suited to portrait photography. 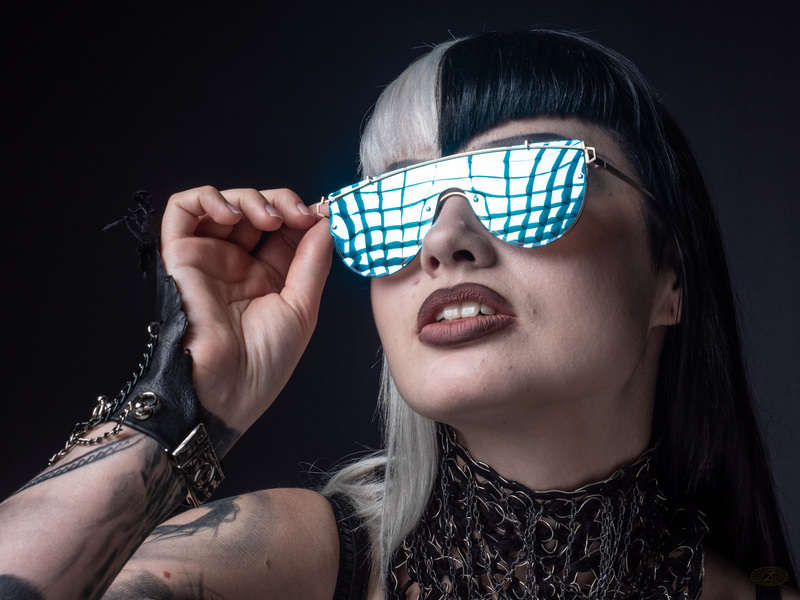 As you can see we had a model for the shoot, her name is Meg Biffin and was a great model for the many scenarios Gavin set up and the many people taking pictures in short bursts. I think this is probably my favourite, looks complex to achieve, but really was quite simple in the end using Gavins experience and knowledge. In the album I have also included a few from the day in London taken with my own Olympus EM5 MarkII as you can see it was a cloudless sky with lots to see and do. The picture below was taken a few minutes before the workshop just down the street from the Park Cameras store. 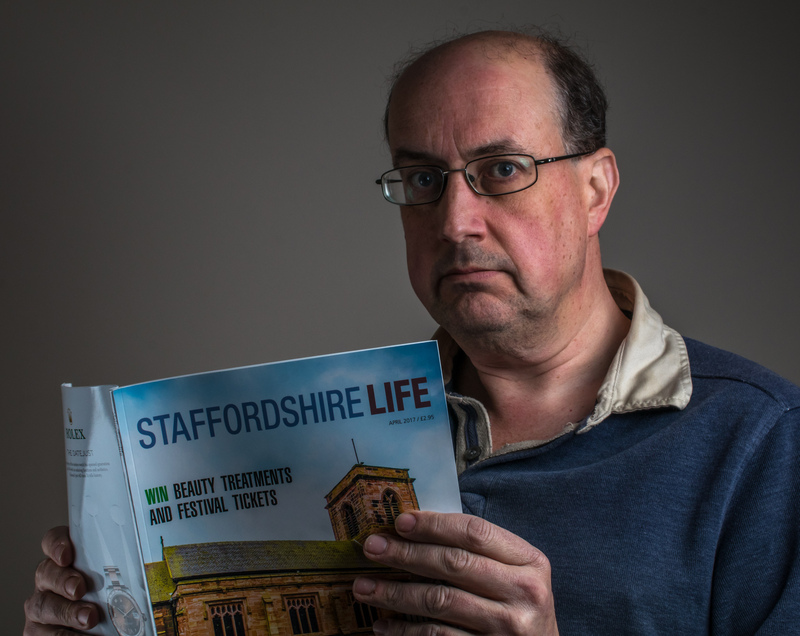 After hearing about Staffordshire day in 2017, I decided that this year I would like to do something interesting to document my day. This idea germinated into a small project to take a Road Trip around the county taking pictures at the four furthest points of the County. After consulting maps and traffic information planning my route with a few places in between. I also decided that I had to try and capture the sunrise on the day and if possible the sunset, although the weather was not promising for the evening according to all the forecasts. 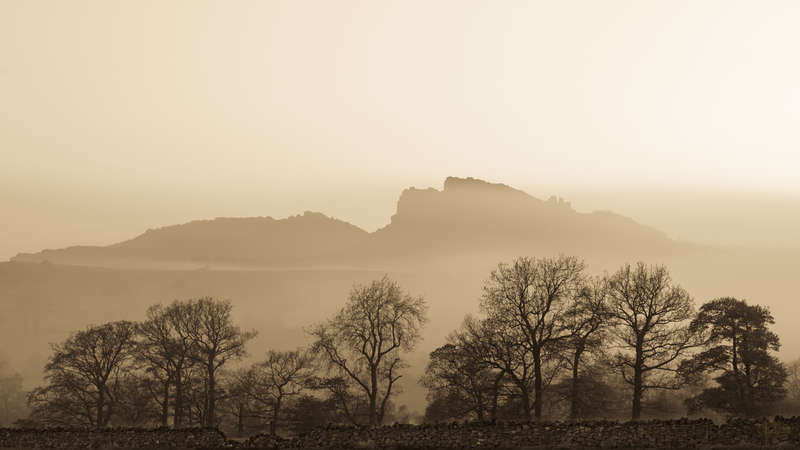 Getting up very early, about 4:30am, the sky was clear and all was looking good, however as I travelled to the North of the county through Leek the fog descended. This is usually an interesting event for a photographer, but I was worried there wouldn't be any sort of recognisable picture visible. In the end by the time I had walked up the path to the Northern most point I was above the fog ! It was a beautiful morning up there and I managed to get several shots from that place of the fog, Moon and Sun. Travelling back towards the next compass point which would be West, I stopped off in Leek to take a few pictures in the early morning sun. Then travelling on towards Stoke, I was driving past the high level view of Rudyard Lake which was beautiful. 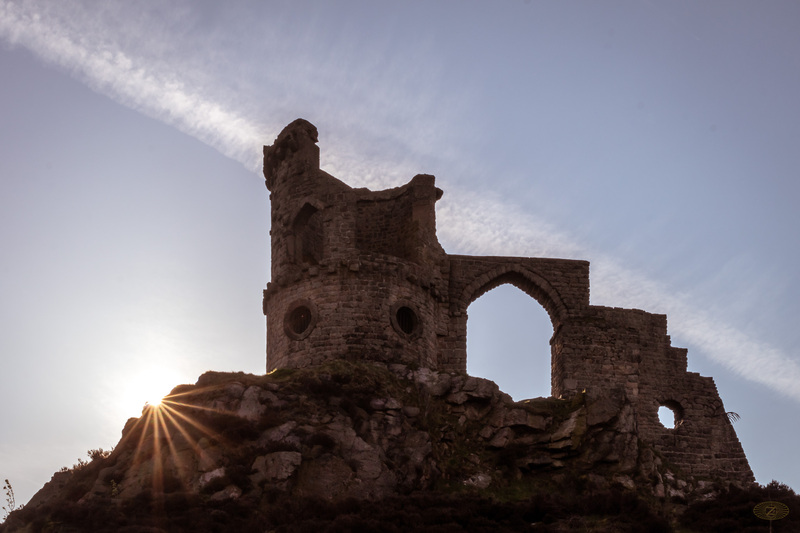 I also decided to call in to Mow Cop castle which by the time I arrived had just opened the car park and the sun was gleaming beautifully off the top of the walls. 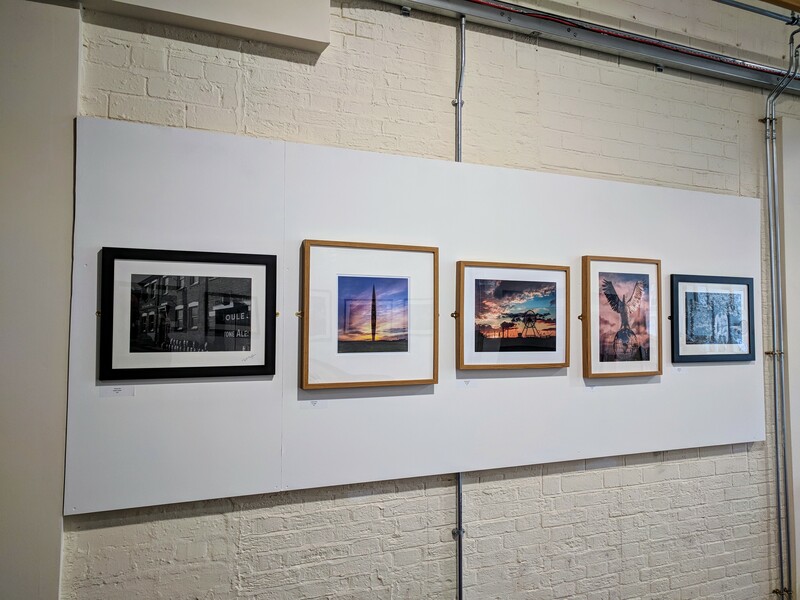 Then, at Stoke I called in to Gallery 116 at the Spode museum to pick up some pictures of mine that had been exhibited in their recent open photography exhibition. It was also a good opportunity to find a Cafe in the town and have some Oatcakes for breakfast. Continuing on to the West I stopped off at Silverdale country park to take a very wide panorama shot of Stoke-on Trent and Newcastle. The next stop was unplanned, but the village pond in Madely looked beautiful so I stayed there for a few moments. Finally I got to Market Drayton and parked next to the canal near where the Westerly point is. Next to my parking spot there was a Swan nesting in a hedge next to someone's house, it completely ignored me as I took a couple of pictures, it's mate was nearby on the canal patrolling up and down. A short walk along the canal later I was at the West of the county. It is a fairly unremarkable and unmarked place on the Canal and the only way to know which was the exact spot was to consult the Ordnance Survey mapping app on my mobile phone. After taking a few more pictures around Market Drayton, which were not in Staffordshire please don't write in :-), I headed off to the next point which would be East. This meant doubling back a little to almost where I started near Stafford, that was always going to happen at some point so it might as well be now. 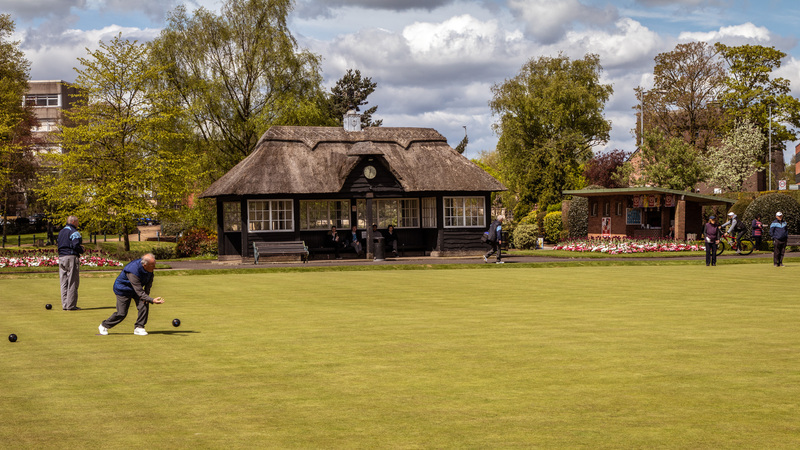 It gave a good opportunity to take a few pictures around the town, mostly in Victoria park where people were bowling and all looked very peaceful. Moving on I decided to go via Shugborough and take a picture of the house and the famous Essex bridge. After this there would be a couple of quick pictures on the way to the next point at Admaston reservoir and of some sheep in the fields. Arriving in Burton Upon Trent I found what should have been the nearest point I could park at and proceeded on foot to the East. It turned out I walked about a mile further than I needed to, but it was such a beautiful day it didn't seem to matter at all. The Eastern point is literally in the middle of nowhere, it is the middle of the river at the end of a footpath through a few fields. For the picture taken at this point a long exposure technique was used, to smooth out the water and make the clouds more interesting as in the time it had taken to walk to this point the weather had started to turn breezy and slightly overcast. Three down and one to go I walked back to the car and then started off towards the South. The first stop on the way was Lichfield as I knew I had to get an image of the Cathedral on Stowe Pool. Then, after a small pause for some food, the next destination was Tamworth, the town was quite full of rush hour traffic by this time and it was quite tricky to get somewhere interesting to stop. Finally I decided it was time to go straight to the Southern most point however, given the shape of Staffordshire, that was trickier than it sounds as the South end of the County is further South than the centre of Birmingham. An accident on the motorways also didn't help as this was causing quite a few problems on the roads. After a much slower than expected journey I arrived near where I wanted to be and walked the fairly short distance to the right point. The Southern point in Staffordshire is actually a fairly unremarkable corner of a footpath in a lovely small wooded area. I took a few images of the right spot and then some more around the area. 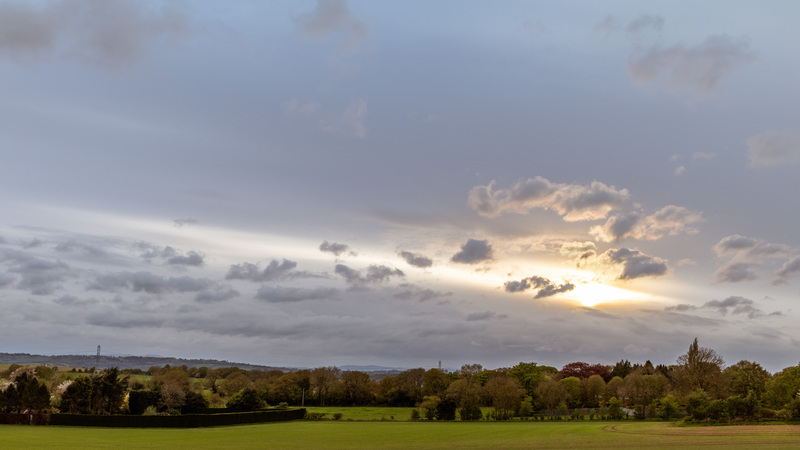 I mentioned before that I wanted to finish the day by taking a sunset picture, but unfortunately by this point the sky was completely covered and apart from a very brief gap in the cloud as I got back to the car, that was it for the sun and it even started to rain as I journeyed home. 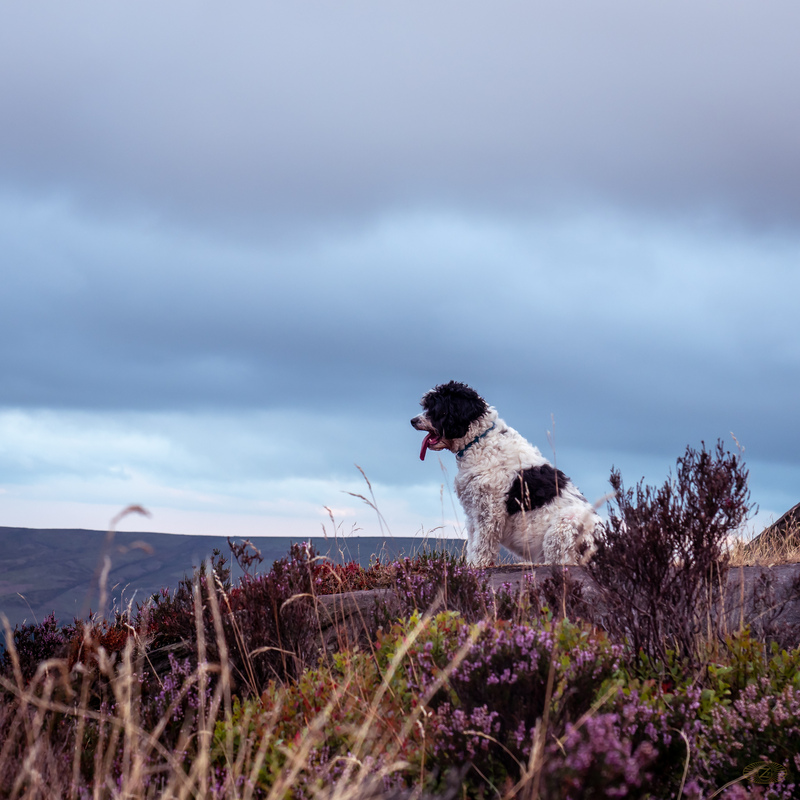 The whole day was a lot of fun, and well worth the time it took to plan and travel around the beautiful County of Staffordshire, touching the edges of Derbyshire, Shropshire and Worcestershire as well. I am really happy with the four pictures (at the top of this article) from the North, West, East and South and I hope you enjoy them too, but also hope you decide to do your own road trip one day as all of the places I visited are definitely worth seeing. 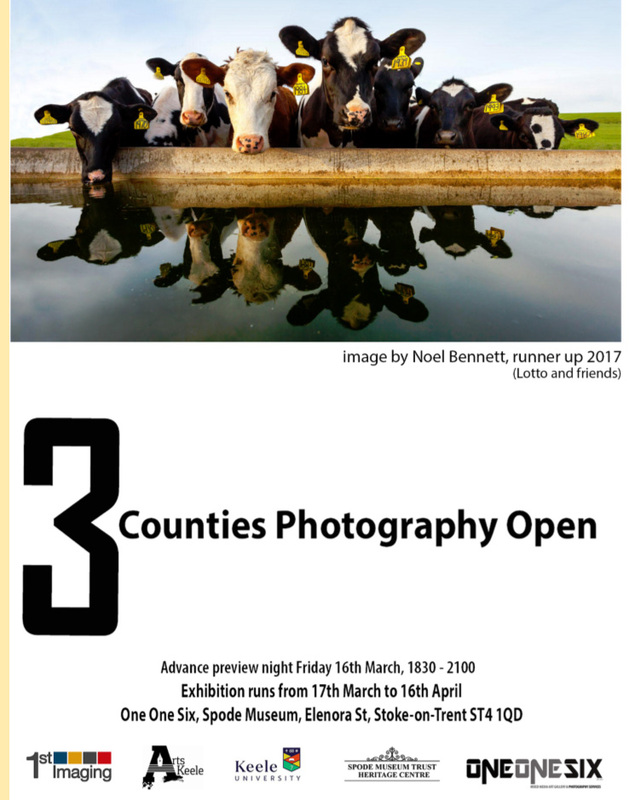 I got some good news at the weekend, three of my photographs were accepted into the 3 Counties Open Photography Exhibition this year. The exhibition will take place from the 17th of March 2018 to 16th of April at the One One Six gallery located on the Spode Museum factory site in Stoke On Trent. 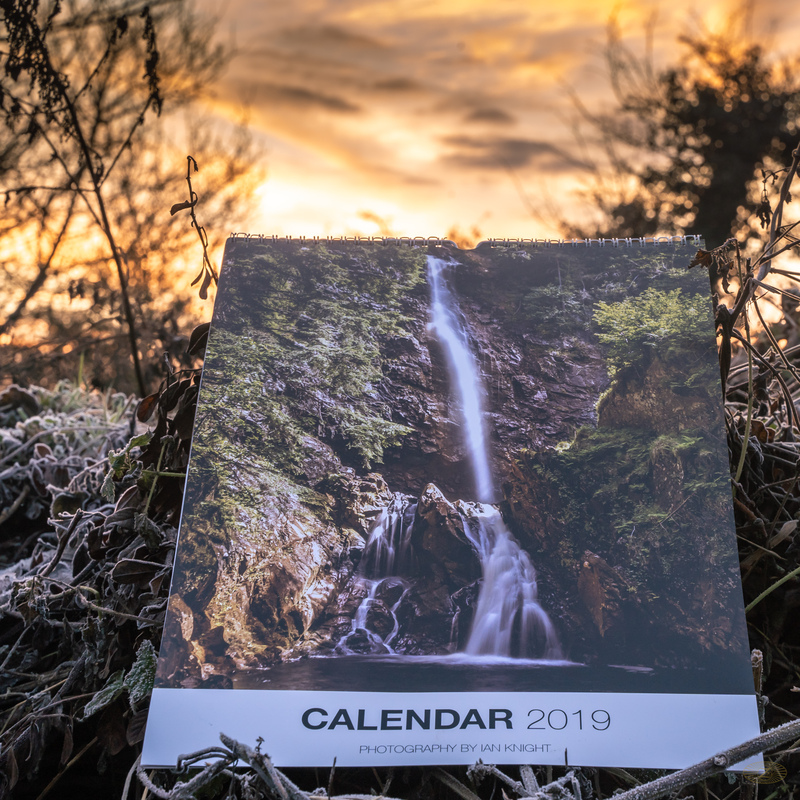 It's that time of year again, this is the second photographic calendar of mine that has been available for sale. Featuring 13 images (including the front cover) of mine taken in the last 12 months, and yes it was hard to choose just 12 to include ! A preview of the months is below. 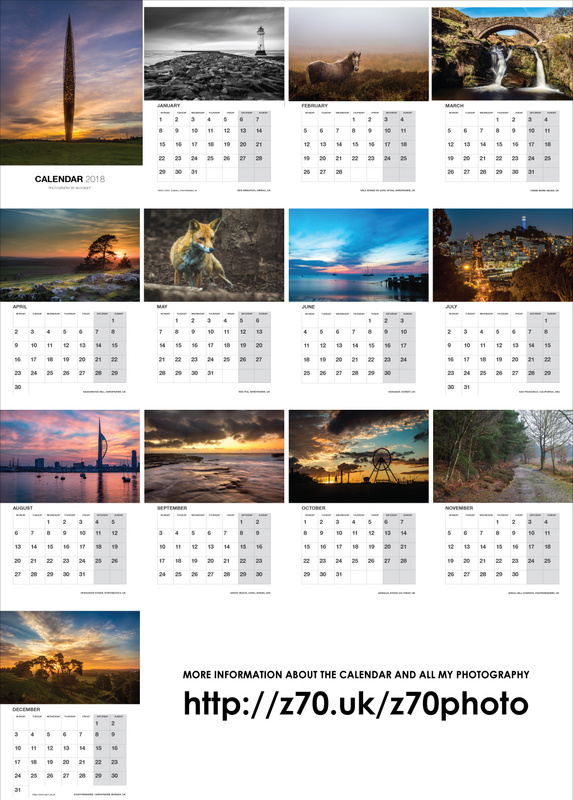 The calendar is available now in my online shop and the price includes free delivery. 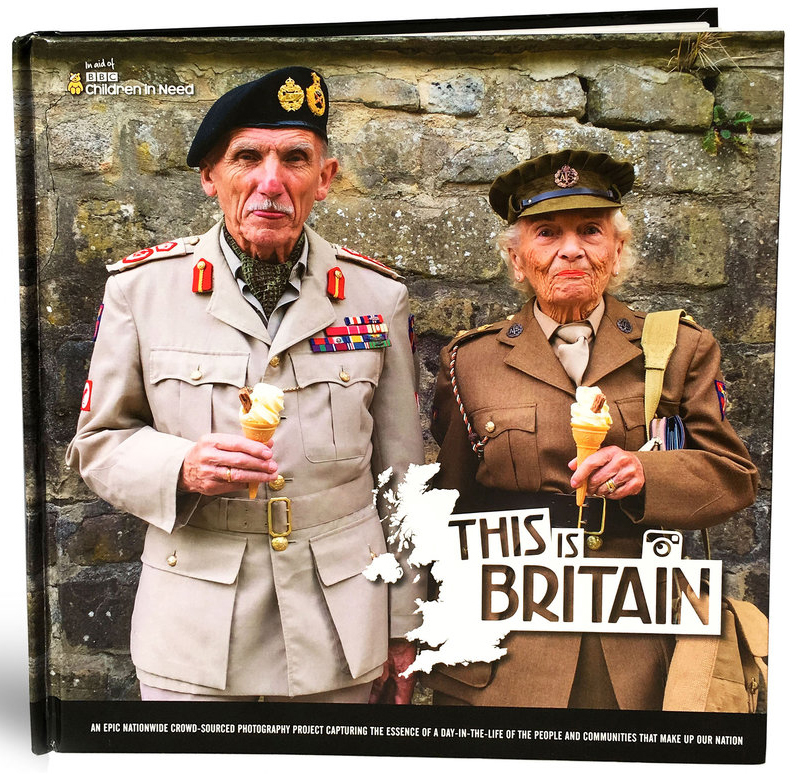 "This is Britain was as simple as it was ambitious: to capture the essence of a day-in-the-life of the people and communities that make up our nation. The faces and places, moments and rituals, at work and at play – as shot by thousands of everyday people going about their daily lives over a long weekend in October"
The book was available for sale on Children In Need night (17th November) and as you can see below the book arrived very quickly. Love the quality of the book and there are some great pictures in there that describe a weekend in the life of Britain. In case you didn't know I have been posting pictures on the BBC Weather Watchers site for almost a year now. The Weather Watchers is just a simple site for anyone to submit pictures of the weather where they are. There is no specific requirement other than the picture must show the weather ! 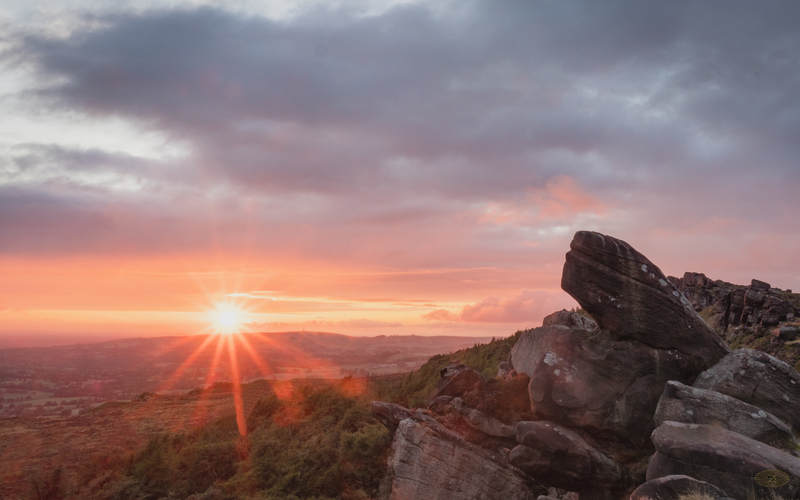 Each day a small selection of the submitted images is chosen as an "Editors Pick" and can be used as to illustrate the day's weather on the BBC weather broadcasts or via their social media channels. 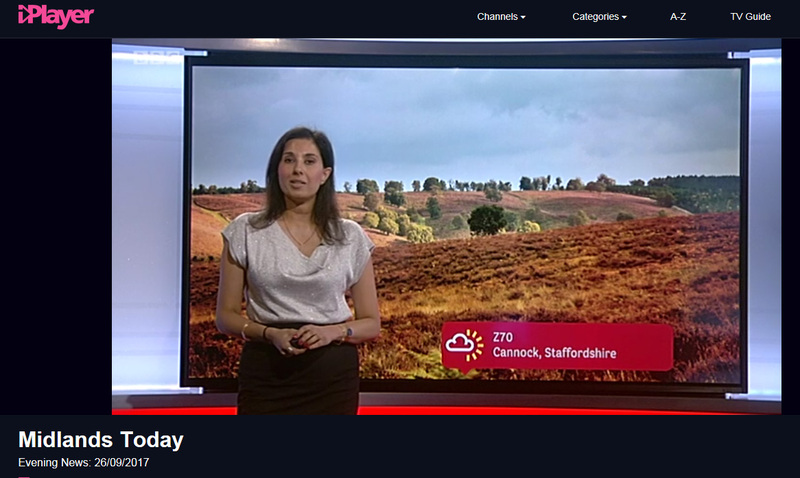 I have had several of my pictures chosen as picks and quite a few have appeared on the Midlands Today weather broadcast. 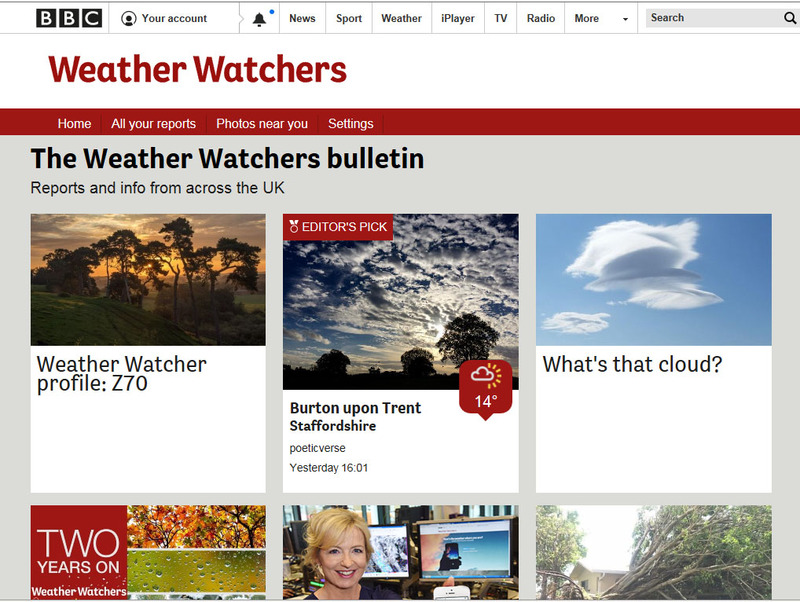 Recently I was contacted by the Weather Watchers team and asked a few questions about my experience with the website and my thoughts on the weather. This resulted in a small profile of me being created on the site which you can see here. I have mention before the website ClickaSnap which uses a micro stock photography model so I get a tiny payment every time someone views an image. 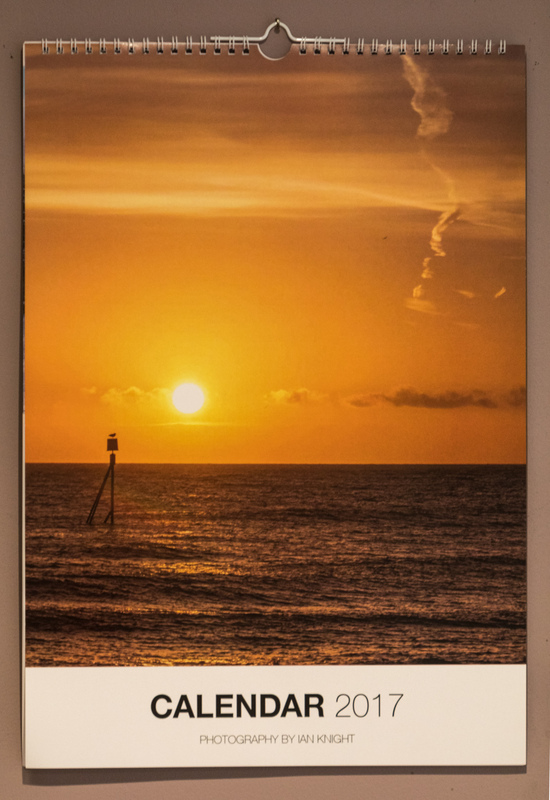 The website also allows me to sell photographs as either instant digital downloads or physical prints, printed by clickasnap and sent out to anyone who would like them. 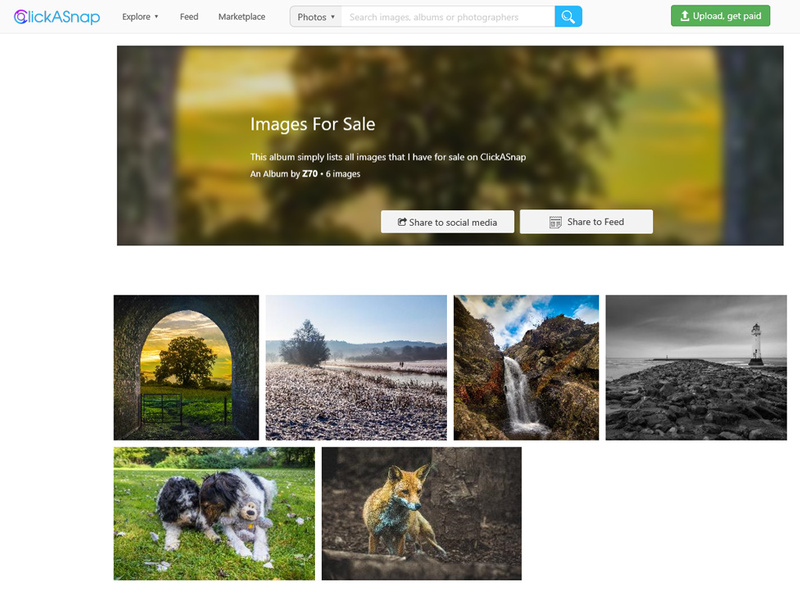 Use this link http://z70.uk/z70clicksale to view an album of all the images for sale on the site. Just click the one you are interested in and you see any purchase options below the photograph. 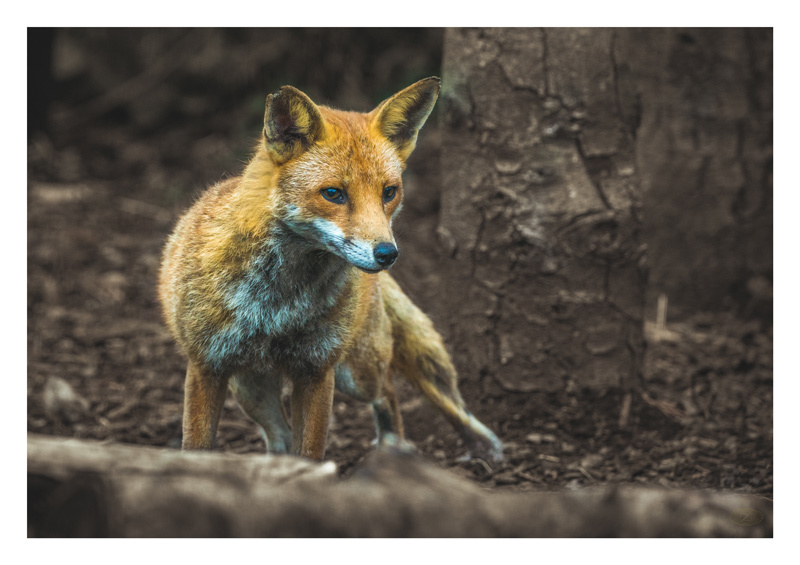 The photograph you can see at the top is of a Red Fox taken in June and is one of the latest ones on sale. I had gone out with a small group of people to photograph Badgers, unfortunately the Badgers were being shy and didn't appear. 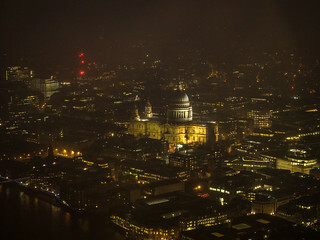 Another photograph taken recently is below, hopefully it is obvious that it is of London. Fiona and I went on a short getaway to see a concert and visit our capital city. There are over 200 photographs of our trip on Flickr, including city views, Robbie Williams, Sunset Pictures,and Dragon Boats ! There was so much to see and do, and after a fairly disappointing weather day this magnificent sky presented itself with moments to spare before sunset. You know those moments when you have a completely odd idea on the spur of the moment, and events fall into place so it can happen, well this is one of those times. If you don't already know Strangeness In Space is a free SciFi Comedy audio series written by and staring "Trev and Simon" from UK Saturday Morning TV. It also stars Sophie Aldred from Doctor Who, and a whole host of supporting characters from the world of TV and film. I knew there would be at least four people at the convention, Trev, Simon, Sophie and Clare Eden who is the producer as well as performing many other roles for the series. This is where the odd idea comes in, I thought why not recreate the classic Queen photograph featured on the Queen II album and Bohemian Rhapsody single. It isn't a massive leap, knowing that I am a big Queen fan, but I thought it would be interesting to know if I could achieve it. After saying hello and re-introducing myself I asked the question and to my delight they agreed to try. It didn't take long to find a quiet spot and organise the picture to be taken. I then decided that, as the convention is fairly local to home, it would be a great idea to go and process the picture, mainly some small background adjustments, and print a copy to present to the team. I did just this and about an hour later went back with the picture you can see above. 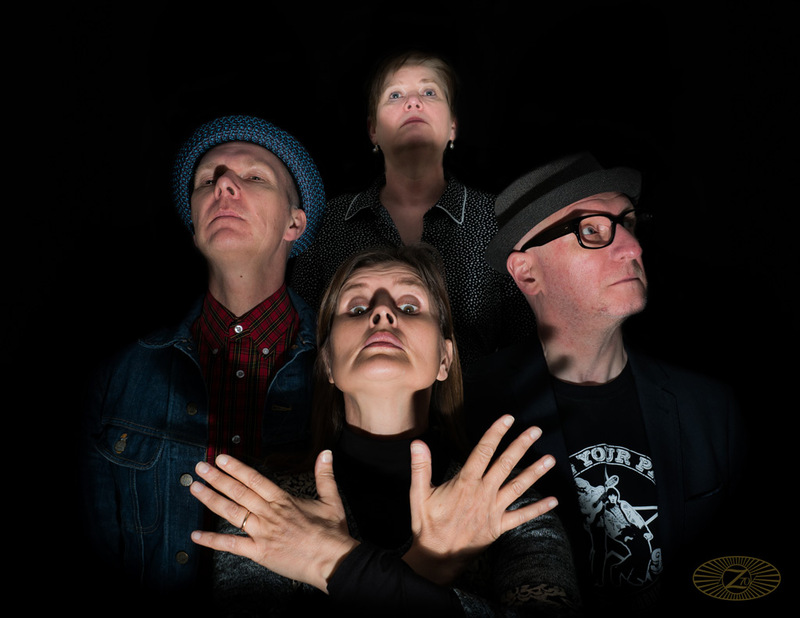 To my delight the Strangeness team were very pleased with the result and decided there and then that the picture could be used to raise some funds for the final part of crowd funding that is currently in progress. By the way I'm the odd looking 5th person at the back in this picture. 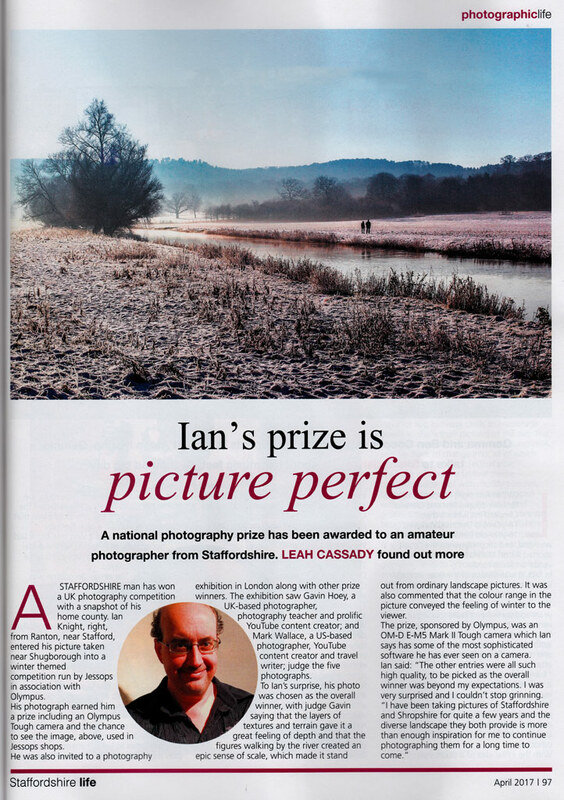 The very lovely people at Staffordshire Life magazine have published a small article in the April issue about my Jessops and Olympus "WINter" competition win. 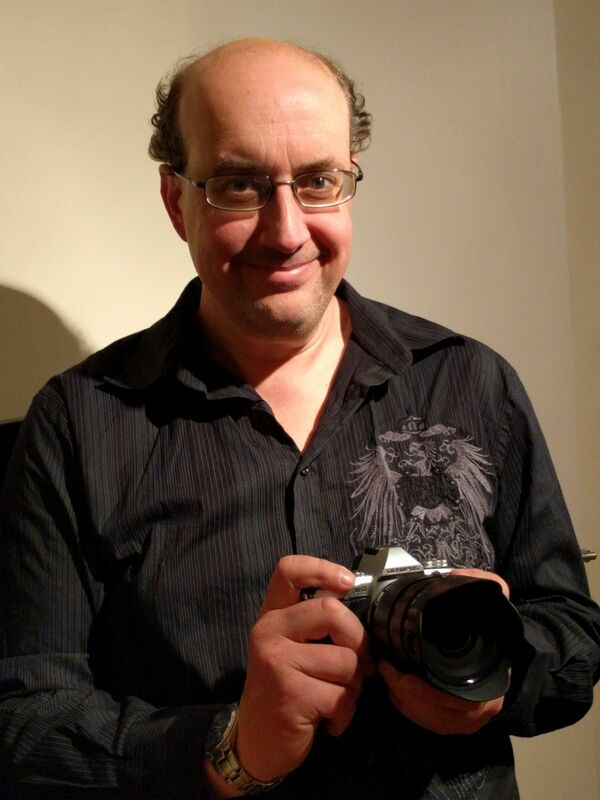 To celebrate the occasion and to test out the new equipment I purchased at the recent UK Photo Show I took a selfie ! Ok, not the sort with a mobile phone at arms length, but a studio portrait style picture using remote triggers for flash guns and the shutter. 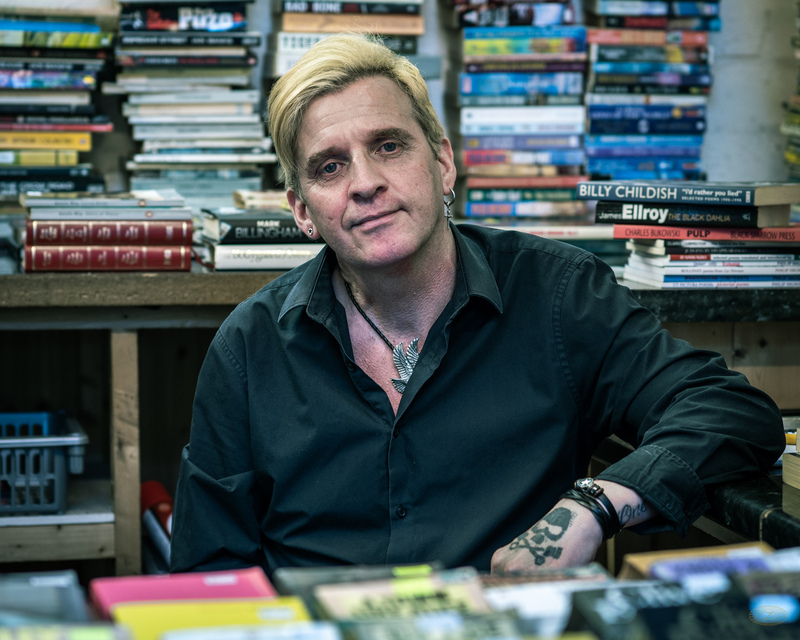 Apart from the quality of the model in the picture, and how grumpy he looks, I'm quite pleased with the result and look forward to taking some more portrait pictures soon. If you want to read the article then you can purchase the magazine, or you can click the image to the right to look at a jpg version of the article. 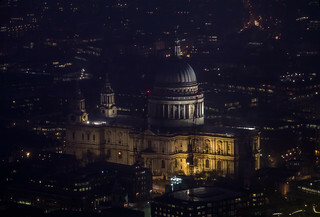 On a related note this winning picture and a few selected others are now available to purchase through the ClickASnap website if you do order any of them please let me know what the experience was like. Hello if you have found my website following the UK Photo Show, I gave out a few small flyers so I hope you came here because of those and were curious to know more. I have a dedicated photography feed on this website if you just want to see my photographic related articles or stick here for a mixture of everything I do. 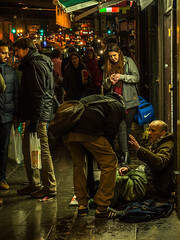 I recently started entering two or three weekly photography competitions, they are great to practice on and give me something to keep in mind during the week when taking pictures. 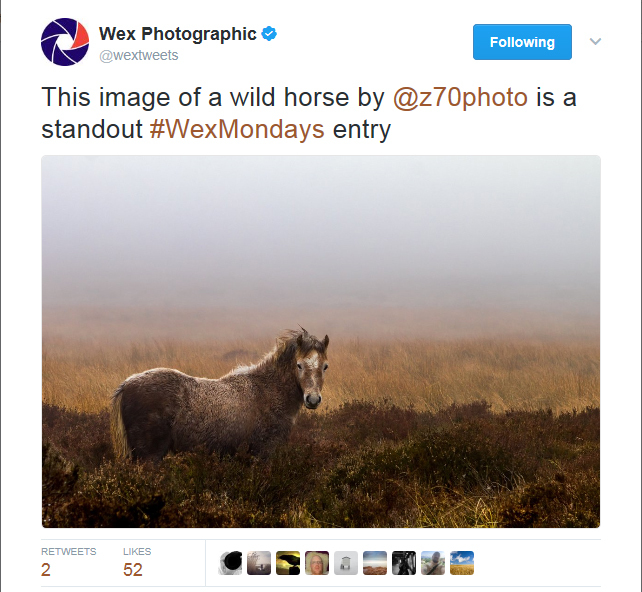 This picture of a wild horse on top of Long Mynd in Shropshire was a runner up. I post all the competition entries and some of my best work on a relatively new twitter feed @z70photo I'm trying to keep that as a post only feed, if you want to talk or keep up with my usual utterences and daft stuff keep following @zort70. I also have a dedicated photography feed on this website if you don't want to see anything else. 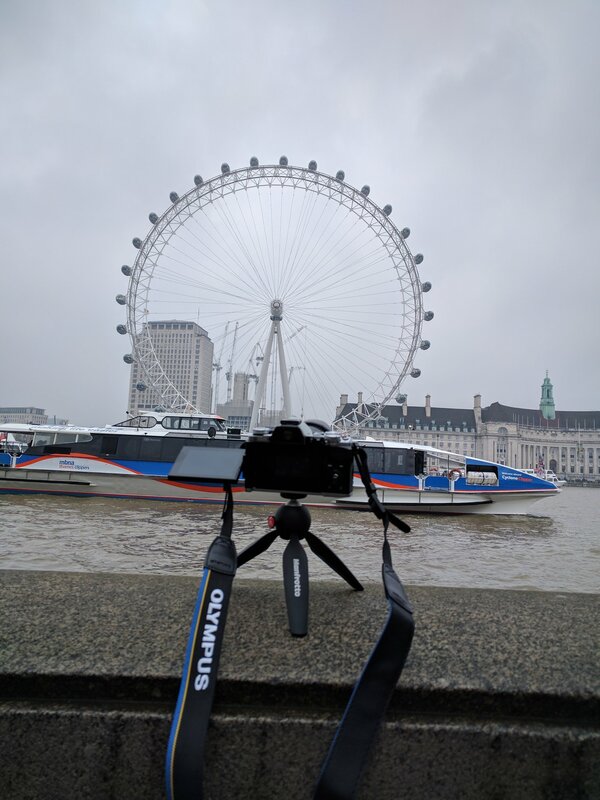 I had taken my Canon 80D with me to London as I had no way of knowing that I would win a new camera, but as soon as won the Olympus EM-5MkII camera I knew I was going to be testing it as soon as possible. After getting back to the place we were staying, I hurriedly took it out of the box and got the battery charging. Looking over the contents there was the usual assortment of cables, straps, pouches and the tiniest flash gun I have ever seen. No instructions to speak of, just a simple quick start guide in a multitude of languages, I assume the full manual is on the included CD but I didn’t have anything to read that so I looked it up online. After a few pages it became apparent that this camera has some of the most sophisticated software I have ever seen on a camera ! 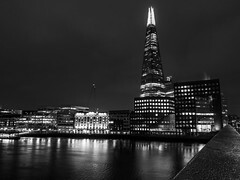 After getting some food and relaxing I grabbed the charged battery, a small Manfrotto tripod I had got for free at the opening of Jessops new Oxford Street store in London, and headed out towards London Bridge which was a 10 minute walk from where we were staying. As I walked I tried to figure out the controls, got it into manual mode and started playing with settings. Once I worked out which dial, switch or button did what, and there are a lot of them to try, I felt quite confident and started taking a few pictures. I have to say after about 5 shots I was dialled in and taking some quite remarkable pictures considering it was gone 10pm and the shutter speed being used was very low. I got to the bridge took a couple of long exposure shots using the small tripod and headed back as it started raining. On the way back I downloaded the Olympus phone app, connected to the camera, transferred some pictures to my phone, edited them slightly and uploaded them to social media, quite remarkable how far technology has come for me to be able to do all of this within a couple of hours of getting a camera that I’ve never used before. After a good nights sleep it was time to hit London and see some sights. 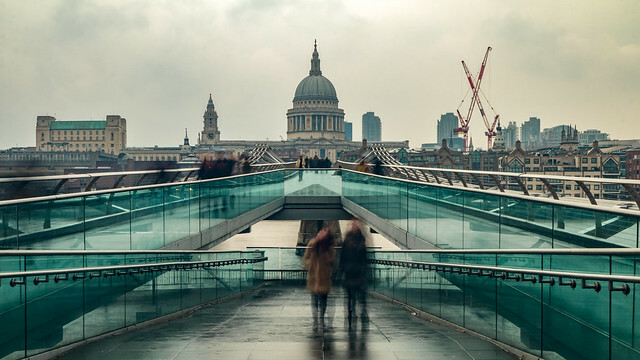 I had taken a couple of pictures the day before (image of the Millennium Bridge below) with the 80D and although I took it with me, along with a couple of lens’ and filters in a big bag, I didn’t use it until the very last part of the day. 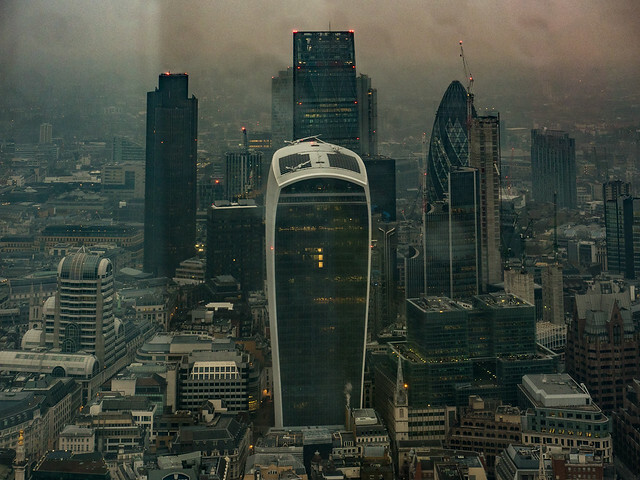 We started off by a trip to the viewing deck of The Shard, unfortunately the view was somewhat marred by fairly heavy fog, so we didn’t see a huge amount from up there, then proceeded to travel around the city, if you look at the pictures in the Flickr album you can probably follow our route. As I was going and taking pictures I was getting more and more used to the camera and which buttons, dials and switches do what, but I don’t think I scratched the surface of the capabilities of the camera as there is so much to choose from. Regarding processing of the pictures I did fairly minimal work in Lightroom and took a decision to apply no noise reduction to any of the Olympus photographs so you can see what they are like without it, I have to say I think it is excellent at handling noise up to 800 ISO as I didn’t go any higher than that. I loved using the camera, and there are so many features that it will keep me busy for quite some time figuring them all out. The electronic viewfinder is new to me and once I understood what it was doing it was really useful, but it caught me out a couple of times as I couldn’t decide if I had taken a photo or not, especially in silent mode. There were a couple of niggles that I think I have to let you know about, there are so many buttons, learning what they all do is a bit of a task, but they are all reprogrammable so if you don’t like which button does what you can swap things around. Because of my fairly large hands and the smallness of the camera I did find myself pushing buttons without meaning to at inopportune moments, especially shifting the focus point to the right for some reason. When using the mobile phone app I couldn’t transfer the RAW images directly to the phone I had to convert in camera first and then transfer the JPG. Not a big problem, but imagine you have a full card and want to get one picture, you wouldn’t be able to without deleting a picture first to free up space. Those are all fairly minor things really, and the quality of the pictures taken by a digital Olympus newbie is really superb (I did use an OM-10 film camera a *cough* number of years ago). Although I had won one of the weekly prizes in the Jessops and Olympus UK competition there was still one more stage to the competition. All of the weekly winners and runners up were invited to London where the Project Art Space Gallery would be hosting a small exhibition. I had arranged to be in London to attend the judging as Fiona and I wanted a couple of days in the city as a pre valentines get away. I got to the gallery slightly later than I wanted to so I was a hot mess after walking from where we were staying, a glass of wine steadied my nerves and I had a look at all the other entries close up. If anyone every asks why I take pictures the answer will be to see them displayed so other people can see them, especially like this. Viewing them online is good but there is nothing like seeing something you have created printed and framed hanging on a wall. 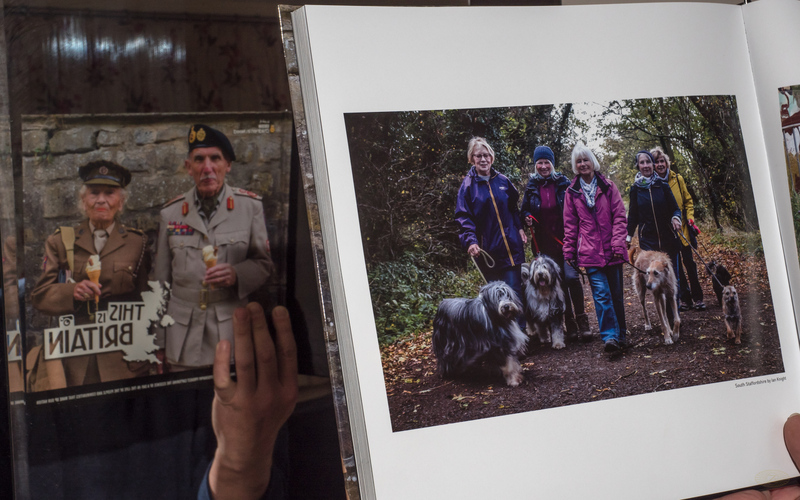 The look and feel of a printed photograph is so much better than seeing it on a small mobile phone display. 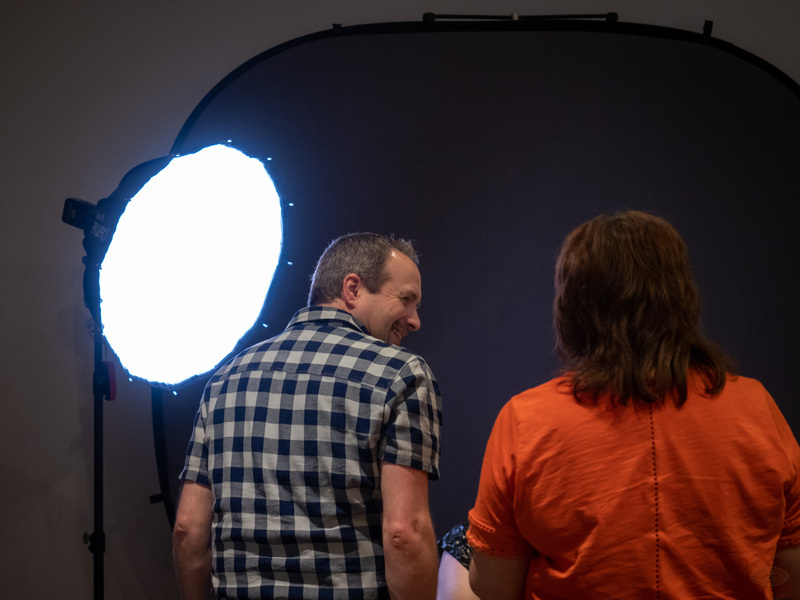 I talked to a few of the people there including Gavin Hoey and Mark Wallace (credit goes to Mark for the picture above) who are both prolific photographers and YouTubers, and it was a pleasure to meet both having seen quite a few of their videos and guides over the years. Then it was time for the judging to be announced, Gavin walked around all of the photographs explain what he liked about them all and finally announced the winner, which to everyone’s surprise, mostly my own, was my picture ! I think I stumbled out a few words of thanks, accepted the prize which is an Olympus OM-D EM-5mkII and posed for a couple of photographs in front of the winning entry. There were then some talks from Gavin and another photographer giving their impressions of the Olympus cameras and showing some fascinating pictures taken with them. Needless to say I am very grateful to Gavin for judging, Olympus UK for the prize and Jessops for hosting the competition in the first place. As to the camera I won when we got back to where we were staying it was straight out of the box and as soon as the battery had some charge I disappeared out to use it. I’ll write another post soon to explain and give links to the pictures taken. 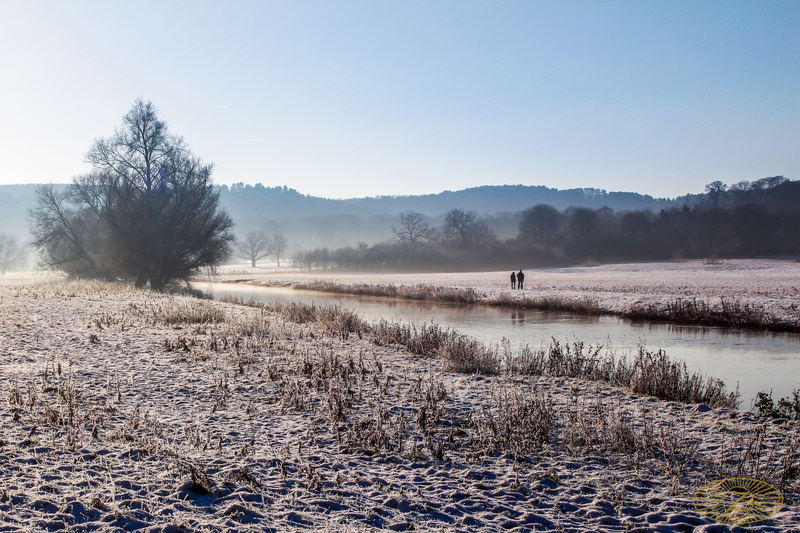 Late in 2016 the UK high street photography store Jessops held a photography competition with the subject of "Winter"
I entered this picture and to my delight it won one of the weekly prizes. 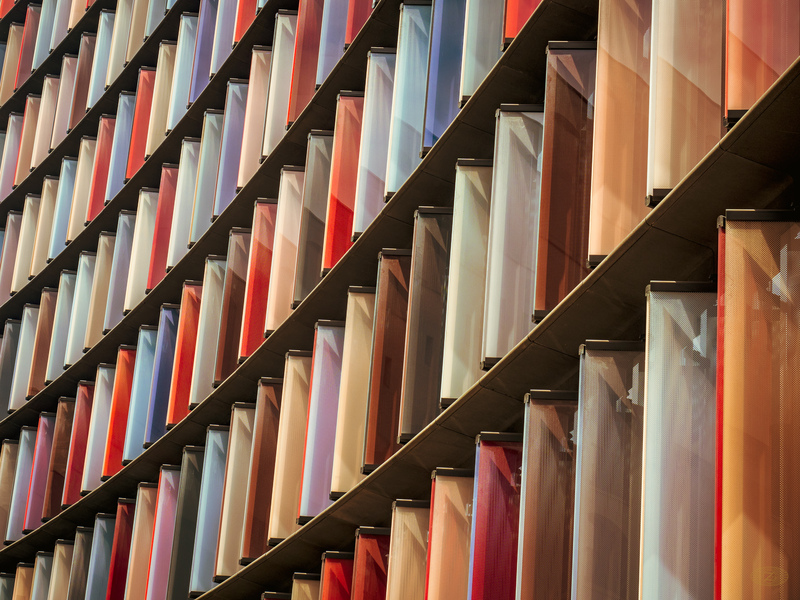 The other part of the prize was a place in a small photography exhibition in London in February, where an overall winner of all the weekly winners will be chosen. I'll post more details of that when I have them. It's not too soon to hang the 2017 calendar is it ? Yes as I've been taking lots of nice pictures this year I created a calendar. It started as a thought about sending out as Christmas presents, but a few people have asked if they can purchase one for themselves so it will be up for sale on my online store for a few weeks. Please share the details if you like it, you never know it could be a collectors item one day ! Photographs from the annual Queen Fan Club Convention 2016 in Mablethorpe, Lincolnshire. A gathering of Queen fans old and new, listening to some great music and with some fantastic live music. 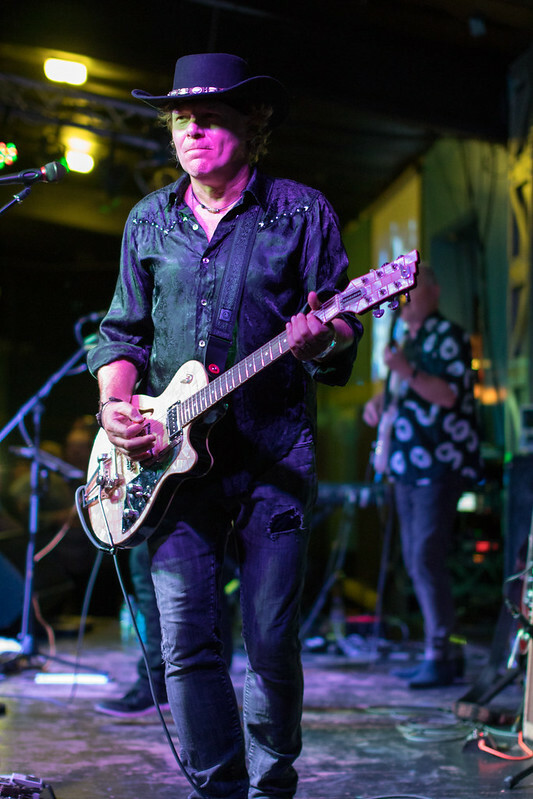 Picture is Jamie Moses of Jamie And The Falcons, the Sunday night Band. I have recently signed up to a new photograph sharing website called Clickasnap click the picture or here to view my uploads. The difference with this site to many others is that if people view the photographs I might eventually get some money ! For each person that views a photograph for more than a few seconds then I get a fraction of a US cent, the idea is that all these views and micro payments add up over time and payments will eventually come through. The small fraction per view that Clickasnap pay is actually the best rate on the internet today so I thought it was worth a go. Star Wars Celebration Europe at the Excel in London was a really great event. Huge amounts to see and do, something for every Star Wars fan. I took quite a large amount of photographs at the event and at the Cantina gig the night before which was very special in it's own right. 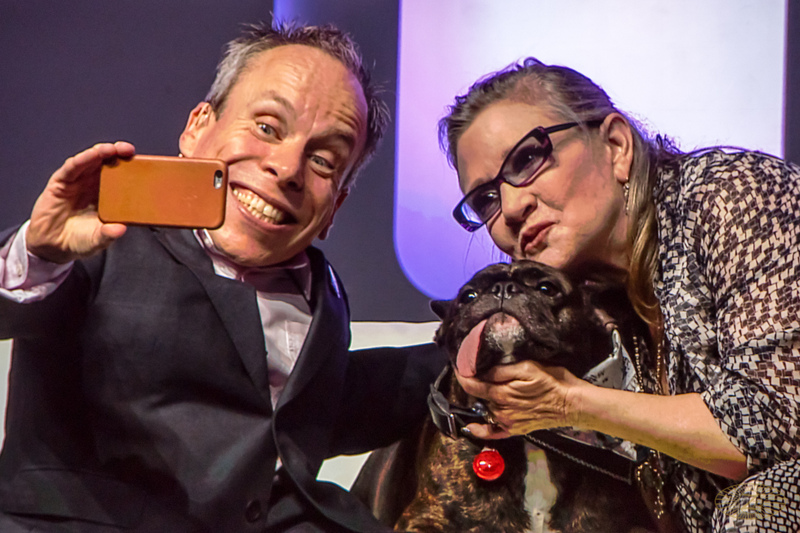 In case you are wondering yes that is Carrie Fisher (and her dog) with Warwick Davies taking a selfie on the main stage ! 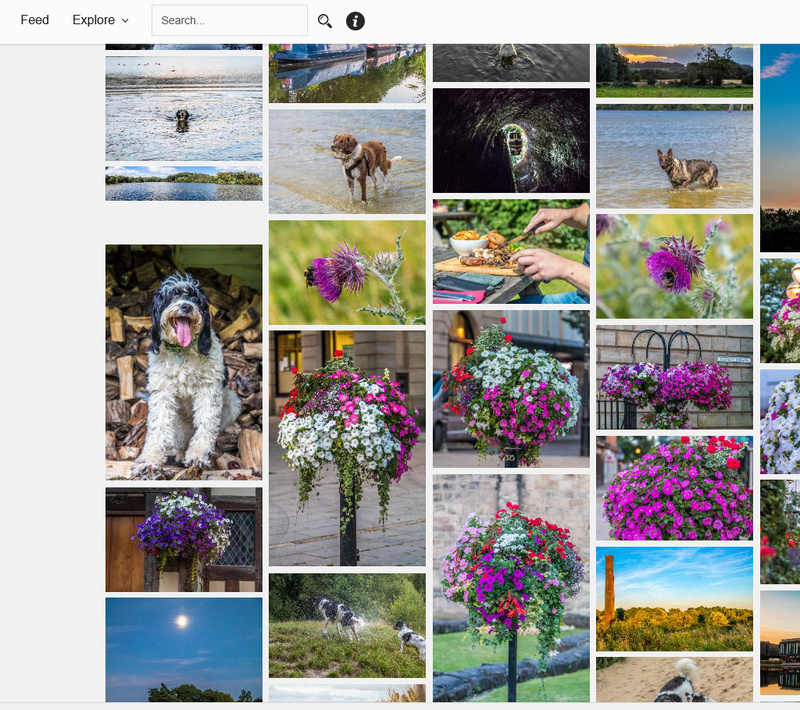 Click the photograph or here to see all of the photographs on my Flickr site. 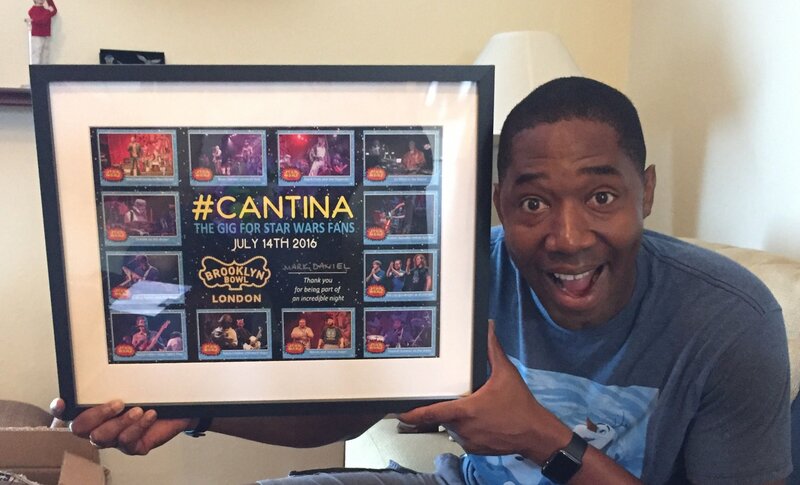 Talking of the photographs and Cantina, one of the organisers of the gig created a set of trading cards with the photographs and sent a framed set to Mark Daniel who compared the gig. Have a look at Mark's twitter post where he posted this picture of him holding the framed set. Something that has been a hobby of mine for many years is photography. 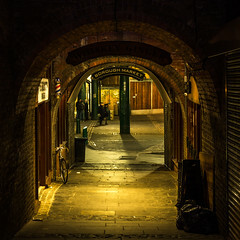 A few people have asked about getting some of the pictures made into prints so that is something I will be investigating soon, but for now have a look, or click on the new portfolio page on this website to see a slideshow of some of the very best. 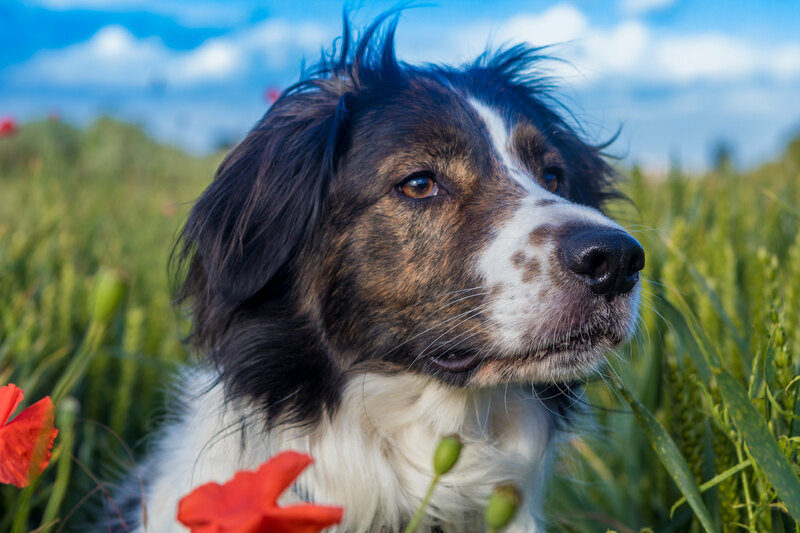 The picture on this post is of our dog Paddy, and a fair proportion of my photographs feature him and his adopted sister Jem.